What's this? Kiko is a brand that I've tried quite a bit of over the past year, and I've always been impressed, despite the really low price tag. So far, I've done reviews of the Eyeshadow Sticks, and the Universal Fit foundation, and today is the turn of the Water Shadows. 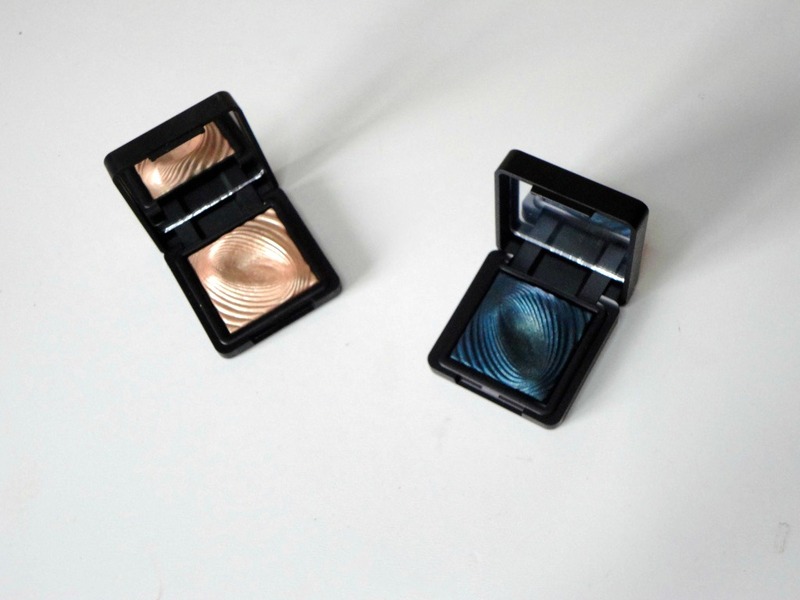 These shadows come in the most gorgeous rippled effect, with simple black Kiko cases. I have the shades 213 and 208. 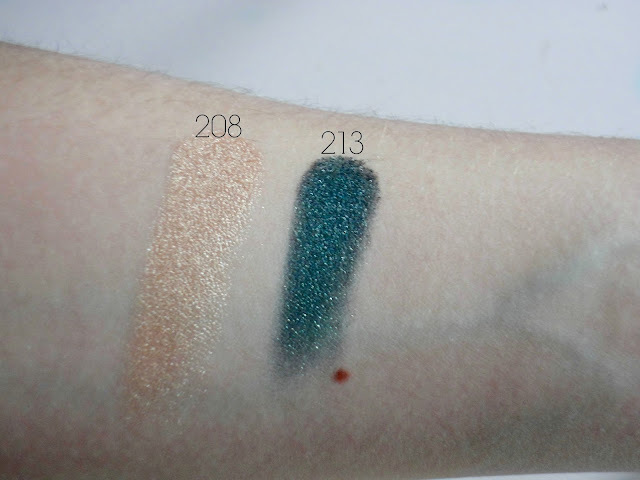 213 is a gorgeous sparkly blue-green shadow with an almost duo-chrome finish. 208 is a gorgeous bright gold colour, that has been hailed as a dupe for both Laura Gellar 'Gilded Honey' and MAC 'Oh Darling' highlighters. Where do I get it? Kiko have stores all across the UK now, and also have a website. To get these shadows, click here for the direct link (they are £8.90 each). The Pros... These shadows are extremely pigmented. They have so much sparkle to them that they are perfect for making a statement, and in 208's case, for an intense highlight. They last really well on the lid and blend out really nicely. I prefer to use them wet as they are even more pigmented then, although they do still look nice dry, and the swatches above are dry swatches too. The Cons... If you're not a sparkle lover, give these a miss. As you can probably see from the swatches, these shadows are nearing on the glitter side, and probably not really ones to use for daytime. Other than that, I really don't have any other disadvantages for them! The price tag is fantastic, and the quality is amazing. 208 is a difficult one to hunt down, with it being so popular as a dupe for more high end highlighters - I only found mine in a store in Barcelona as I had no luck in the UK! What do you think? Have you tried these shadows before? Or anything else from Kiko? Let me know in the comments!